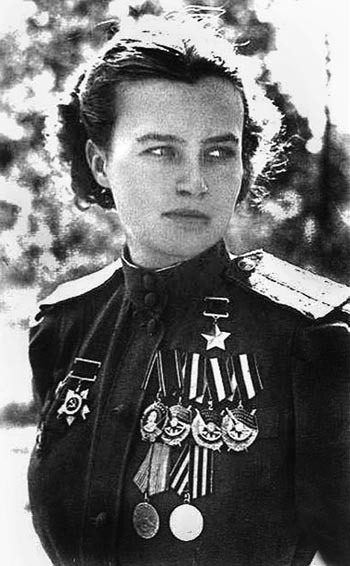 Valentina Stepanovna Grizodubova, Hero of the Soviet Union. 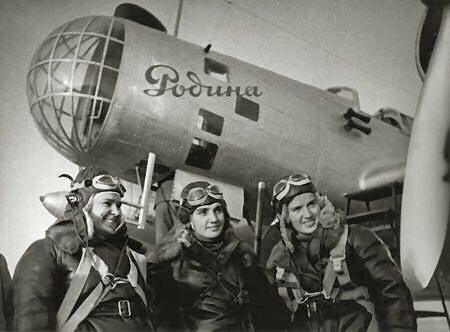 24–25 September 1938: Valentina Stepanovna Grizodubova (Валентина Степановна Гризодубова), Polina Denisovna Osipenko (Полина Денисовна Осипенко) and Marina Mikailovna Raskova (Марина Mихайловна Раскова) set a Fédération Aéronautique Internationale (FAI) World Record for Distance in a Straight Line Without Landing when they flew a twin-engine Tupolev ANT-37 named Rodina from Tchelcovo, an airport near Moscow, Russia, to the River Amgun, Khabarovsk Krai, in the Union of Soviet Socialist Republics. The distance was 5,908.61 kilometers (3,671.44 miles).¹ The duration of the flight was 26 hours, 29 minutes. The planned flight was from Moscow to Komsomolsk-on-Amur. In adverse weather conditions, they missed the airfield at Komsomolsk, and out of fuel, crash landed in a forest near the Sea of Okhotsk. Raskova was ordered to bail out of the airplane to avoid being injured, and she wandered for ten days before she located the crashed ANT-37. The other two remained with the ANT-37 and survived the landing. They waited by the wreck for Raskova to arrive. All three were made Heroes of the Soviet Union. 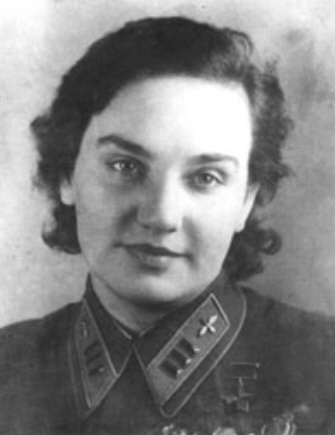 Polina Denisovna Osipenko, hero of the Soviet Union. 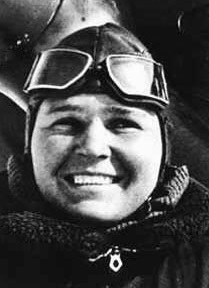 Polina Osipenko was killed in an airplane accident in 1939. Marina Raskova died when her bomber crashed in 1943. She received the first state funeral of the war. Valentina Grizodubova survived World War II and then served on a commission investigating Nazi war crimes. She died at Moscow in 1993. The Antonov ANT-37, given the military designation DB-2, was a prototype long range medium bomber designed and built at Tupolev OKB. The design team was led by Pavel Sukhoi. Rodina, the airplane flown by Grizodubova, Osipenko and Raskova, was the first prototype ANT-37. It had crashed during testing 20 July 1935, but was rebuilt as the ANT-37 bis, or DB-2B. The nose section was modified and the engines and propellers upgraded, all military armament was removed and larger fuel tanks installed. It was powered by two air-cooled, supercharged, 2,359.97-cubic-inch-displacement (38.67 liter) Tumansky M-86 two-row, 14-cylinder radial engines. They were rated 950 horsepower at 2,250 r.p.m. for takeoff and drove three-bladed, variable pitch propellers. (These engines were license-built versions of the Gnome et Rhône 14K Mistral Major.) The main landing gear was retracted by electric motors. The airplane was operated by a crew of three. It was 15.00 meters (49 feet, 2.6 inches) long with a wingspan of 31.00 meters (101 feet, 8.5 inches). Its empty weight was 5,855 kilograms (12,908 pounds) and gross weight was 12,500 kilograms (27,558 pounds). The maximum speed was 300 kilometers per hour at 0 meters (186 miles per hour at Sea Level) and 342 kilometers per hour (212.5 miles per hour) at high altitude. The service ceiling was 8,000 meters (26, 247 feet). Rodina was repaired and operated by Aeroflot, then, until 1943, by the People’s Commissariat of Aircraft Industry.